Ramayana Masam in Kerala is observed in the Malayalam month Karkidakam (July – August). On all days in the month, the Epic Ramayana is read in traditional Hindu houses, by Hindu organizations and in temples dedicated to Lord Vishnu. In 2019, the Ramayana Masam begins on July 17 and ends on August 16. The reading of the Ramayana begins on the first day of the month and is completely read on the last day of the month. The famous Malayalam Version of the Ramayana titled Adhyatma Ramayanam Kilippattu written by Thunchath Ezhuthachan is the one recited in the month. After lighting the evening lamp, people sit before nilavilakku (traditional Kerala lamp) and recite the Adhyatma Ramayanam. The reading of the epic is managed in such a way that the reading ends on the last day in the Karkidakam Month. The Karkidakam month is the last month of the Malayalam calendar. The monsoon is at its peak in this month, and during olden days majority of the people in Kerala depended on agriculture. Due to heavy rain, the Karkidakam month is referred as ‘panja masam’ or the month of scarcity. With the paddy fields flooded, there used to be no work and the economy used to come to a standstill. People used to solely depend on what grains they had stored during the previous harvest season. There used to be such heavy rains that it was even hard to go outside the house or village and earn a living. To ward off nature’s fury people used to read the Ramayana. As per Malayalam Panchangam, new ventures and auspicious functions are not held during this month. 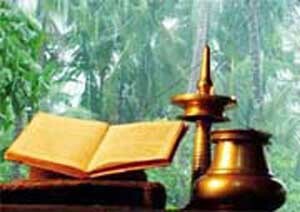 Even though the Karkidakam month is referred as Ramayana Masam, the reading of it in Hindu houses in Kerala is a rarity. Instead of houses, the Ramayana is now read in temples and in programs conducted by organizations. Hindu spiritual and religious organizations organize public discourses, quiz competitions, plays and recitals based on Ramayana in the month. Another unique feature of the month is the sale of the book Adhyatma Ramayanam. All the publishers in Kerala bring out the Adhyatma Ramayanam Kilippattu written by Thunchath Ezhuthachan. Nowadays, CDs, VCDs and DVDs of Ramayana recital are released in the month. Thanks to the explosion of satellite television, almost all the Malayalam Television Channels telecast Ramayana reading and programs based on the epic. The Amavasya day in the Karkidakam month is dedicated to dead ancestors and Hindus perform special pujas at the seashore and on riverbeds on this day. A pilgrimage to the four temples dedicated to Lord Ram and his brothers is undertaken in the Ramayana Masam. This is known as the Nalambalam Darshanam. How to Read the Ramayana? Clean the house to drive out all negative forces. On Karikadam 1, wake up early take bath and visit the nearby temple. Prepare Ashtamangalyam, light a lamp. At other times, read-only facing north. There is no rule regarding how many pages to be read. Never stop the reading when the line is dealing with war, sadness, death or other negative emotions. Always read two auspicious line and stop for the day. Once you start reading the Ramayana should be read on all days of the month. Anyone one can read the book in the home, it is not necessary that a single person should read it daily. Uttara Ramayana should not be read. The chapters starting from the birth of Sri Ram till his coronation only should be read. The fourteen lines starting with Sri Rama Rama....in the Bala Kandam should be daily read in the beginning. On a day in the month, it is highly meritorious to perform Annadanam (food donation).